What are the best inspirational end of year quotes? Looking for famous quotes and sayings for closing the year? The end of the year can be such an emotional time of year for us all. Whether it was your best year yet, or not so great, you definitely start to get the feels as the end approaches. Are you ready to close the chapter on 2018, and welcome the new year with all its new possibilities? What will the new year have in store for you I wonder? Will this be the year you finally go after your dreams and achieve your goals? I sure hope so! Whether making New Year’s resolutions is your thing or not, this time of year is perfect for reflection and futurecasting! That’s planning ahead, visualizing where it is you want to be in 2019, and taking steps to make it happen. Take a moment to discover what it is you want for yourself in the New Year. Do you know? You really should. In 2019, will you make money from home or start your successful blog? Perhaps you’ll become more spiritual or finally make time for doing what you love? There are endless possibilities for you. Each end of the year is your new beginning! So no matter how you felt about 2018, put it behind you and move forward into the new year with a renewed sense of purpose and excitement. Get motivated and be inspired to do your best in the new year. Here are 52 inspirational end of year quotes for a happy new year. May each of them encourage you to make the most of this time of year. The end of the year is just a new beginning! Without an end, there would be no new year, no new start. This selection of Inspirational End of Year Quotes welcomes the new year and the opportunity to begin again, to be reborn on January 1st. Let the anticipation of the page turn, and all the magic that comes with it get you excited for the new year. The end of year signals a new beginning for us all, but that doesn’t mean we start over from square one. We have to remember each and every lesson we learned in the previous year and carry them forward with us. This collection of Inspirational End of Year Quotes and sayings reminds us to learn from our past, so we can accelerate our futures. No matter how painful or disappointing last year was, don’t forget what it taught you! A fresh year full of endless possibilities awaits you just around the corner. Be optimistic, be hopeful and above all be thankful for all you have. Appreciation and an attitude of gratitude in the new year can open so many doors for you (way more than being super grumpy). The following Inspirational End of Year quotes encourages the optimist in all of us to seek the bright side, and be positive no matter what. The honest truth about the end of the year is that it isn’t always cheerful or joyous! It can be an extremely emotional time of year for us. When we’re faced with what we’ve done, or haven’t done. What we’ve achieved, and have yet to achieve. It can haunt us and make us miserable. So, here are some honest End of Year Quotes for the pessimist in all of us. Maybe you even think setting New Year’s Resolutions is silly and a waste of time, and that sticking to your resolutions is impossible. That’s okay! It’s a completely normal reaction to feel behind and even angry with yourself for not doing what you said you would this past year. And to even feel as if you just can’t get started, like it’s too hard and you’re stuck. But never give up on your dreams or your goals, it’s never too late to get started. 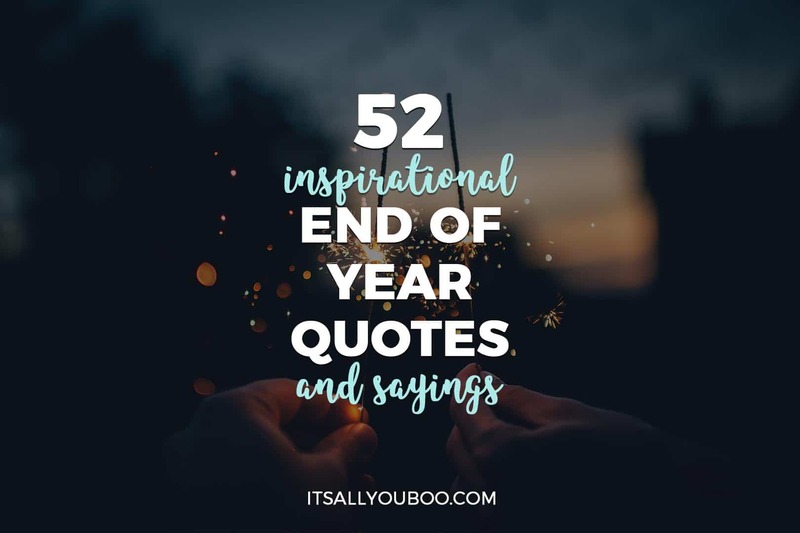 This collection of Inspirational End of Year Quotes encourages you, nay emplores you, to just get started! Nothing says a new year like new opportunities! Oh, all the goals you’ll set and achieve, all the plans you make and accomplish. The end of year announces to us that 365 days of opportunity are here, what will you do with them? The following inspirational end of year quotes reminds us of the potential that awaits us in the New Year. The end of the year is here, and hopefully the end of all the excuses for not making it happen. 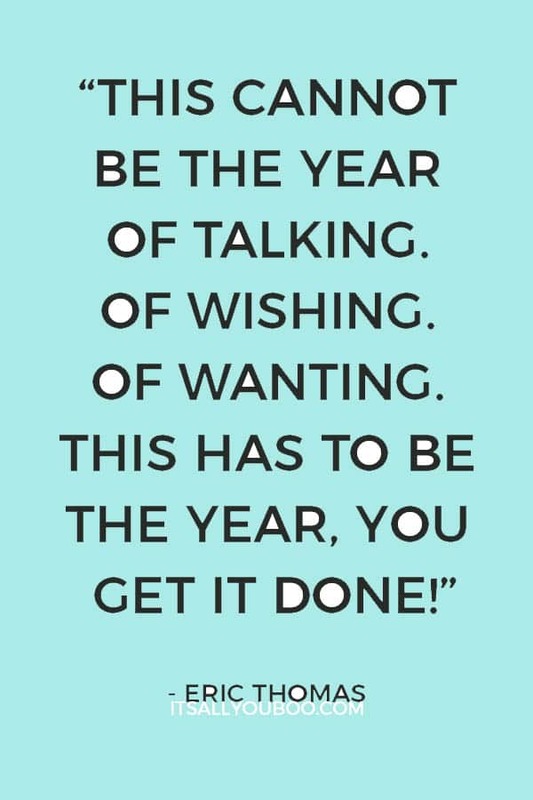 No more waiting, no more putting it off, this year is the year to take action in your life. These motivational New Year’s quotes and sayings remind us that it’s not enough to wish and want, nor to set goals, we must also act! 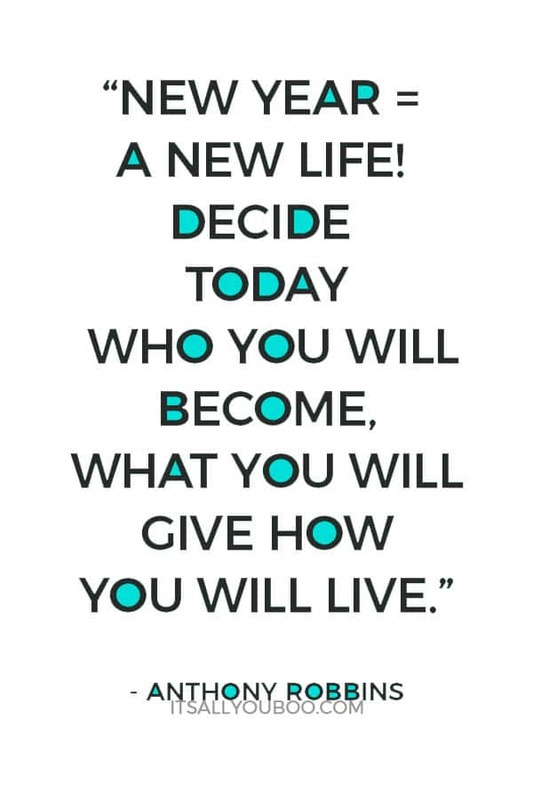 Let’s make 2019 your best year yet! When it’s almost new years there’s so much talk of goal setting and planning, but the best-kept secret for achieving your goals is to create new habits! Change your life in a major way this new year by focusing on one small habit at a time. 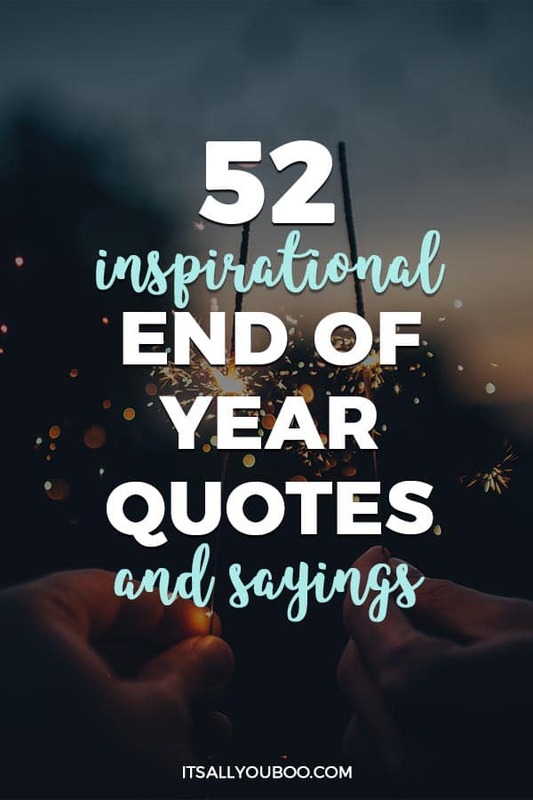 These famous end of year quotes shares things to do and ways to make 2019 even better than the last. 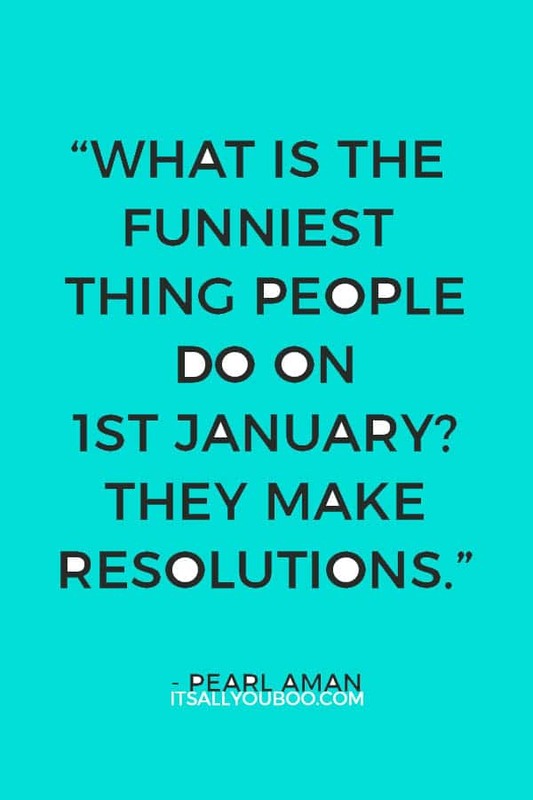 What unique new years resolution will you set? What will you check off your bucket list? The end of the year means a new year filled with adventure is here. New places to explore, new skills to learn, the new potential to unlock! The sky is the limit for you if you set out on and explore. This collection of inspirational new year’s quotes encourages you to get up off that couch and truly live! Who are you and who have you always wanted to be? The end of the year is a chance for you to be a better person that you were. To do better, to treat others and yourself better, to care more, to try harder – whatever it is you aspire to be! These motivational end of year quotes and sayings inspire you to be the best version of yourself. Don’t just live your best life in 2019, be your best self too! Ready to make the most of the end of the year and choose an inspired New Year’s Resolution? 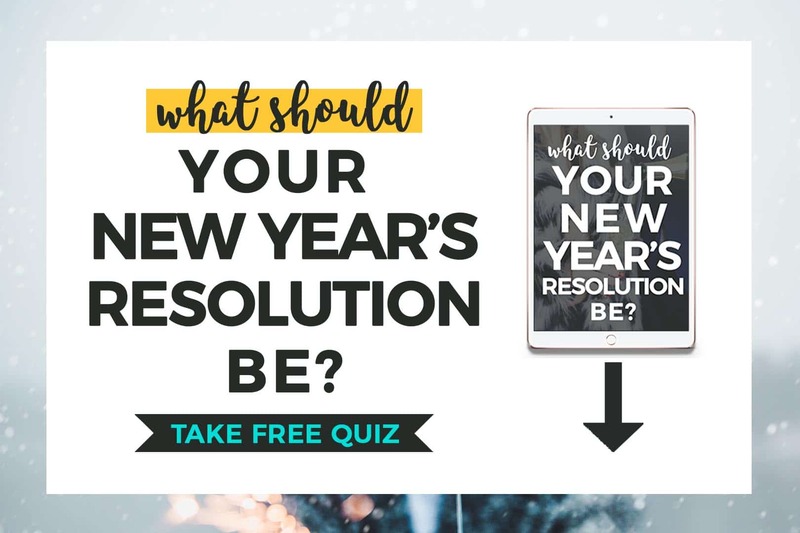 Take the New Year’s Resolution Quiz and discover what area of your life you should focus on. Plus, get personalized resolution ideas just for you. What’s your favorite inspirational end of year quote? Me too! Let’s all get out into the world and explore, try something new! Great quotes all around on here. I for one never was a fan of resolutions. Strive for goals everyday every year. But the pessimists quotes are hilarious and should be on a T Shirt ! I know right! I just loved those end of year quotes. Pessimistic for sure, but 100% accurate. These funny end of year quotes would be PERFECT on a T-shirt. 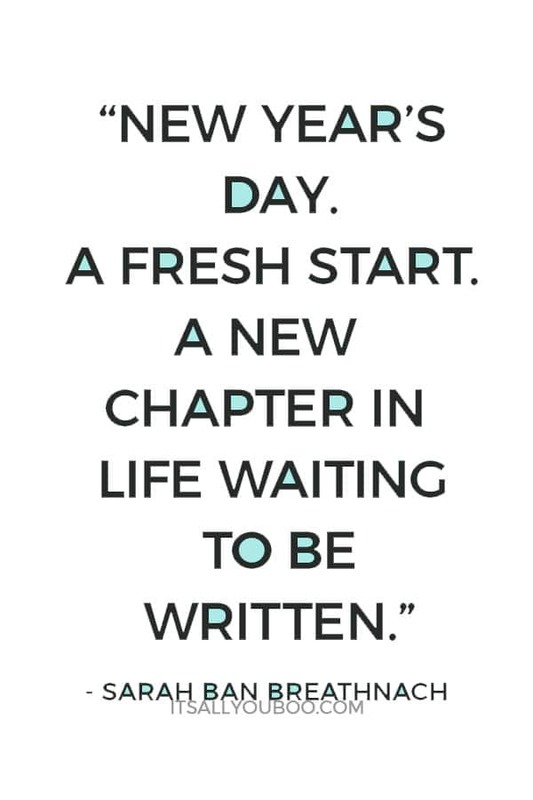 I know some people hate New Year’s resolutions, but I’ve always loved them for exactly the reason your Beecher quote spells out – because of that concept of a fresh start. That’s how we should think of every new day. I’ve had years where I just refused to even set one, it just feels like a wish. But, like you say, part of me LOVES this idea of starting over. Sure n t does meck sense. Love t .
I love this! I need to start working on my New Year quotes. It would help to keep me focused throughout the year. So glad you enjoyed these inspiration end of year quotes, Stacie! Love! Love! Loveeee this! I’m a sucker for a good quote! I’m definitely keeping and sharing this list. Yes, yes, yes! Woohoo – thanks for saving these amazing quotes. May they inspire your new year! Some of these really got me excited, for the new year. I had an amazing 2018, and I know that 2019 is going to be even better. I’m thankful for the lessons learned, and I am ready to start writing a new chapter. I love that! 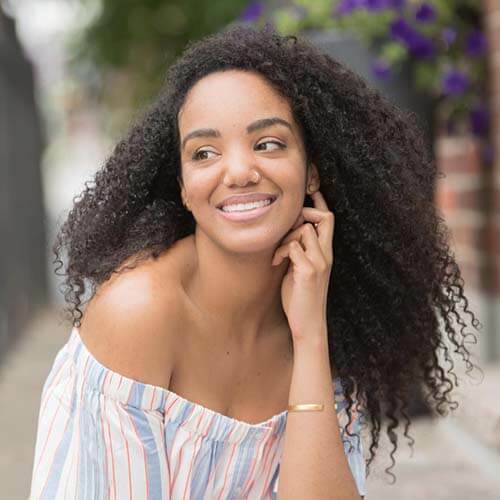 I get that way too with quotes – it’s almost impossible to not be excited for the new year and all that it has in store for you after reading these. Happy New Year! Great quotes and so perfect at the end of the year. Wishing you a happy new year, Lia! My favorite saying that you shared was, “On this New Year be someone that you yourself can admire.” I think loving and knowing yourself is at the root of this saying. 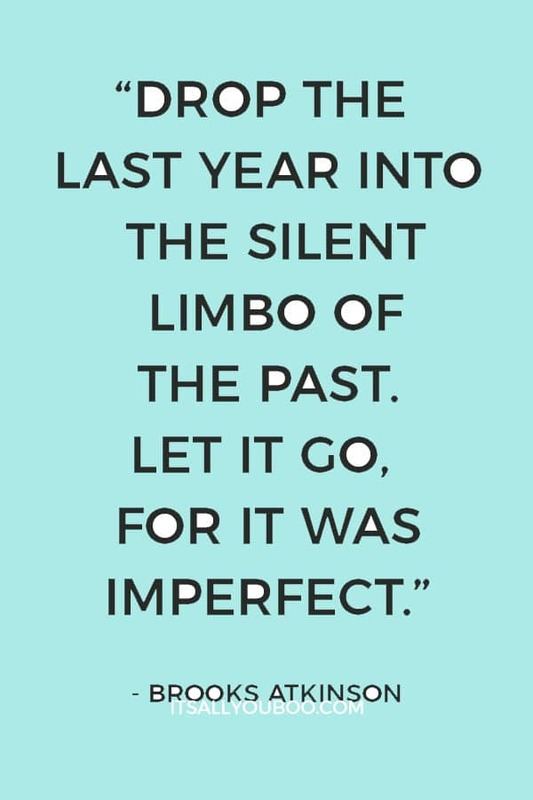 Isn’t is such a beautiful end of year quote? It’s one of my absolute favourites. It is so important to have affirmations you can pull from at any time of year to help keep you focused and feeling hopeful. The end of the year is also a great time to reflect on where you’ve been in the previous and where you want to go in the next year. I completely agree with you, they are the perfect affirmation! Not just for the end of year, but great for whenever we need to be reminded to start fresh. YES! What a fantastic quote. I feel the same way about this coming year – THIS will be it. Cheers to you! Wishing you a happy end of year! Glad you enjoyed the quotes. These are all great quotes but my favorite one has to be by Edward Payson Powell. I do believe you should leave all the bad thing that has happened to you behind and move on to the new year. I really appreciate that the most about the new year, it’s a chance to put some distance between us and “all the bad” that happened before. Wishing you the best new year! I love all quotes and sayings that are inspirational. I read them every day and post them in my home, office, and classroom. They definitely help change your mindset and your perspective. So good for the soul. Thanks for all of these! 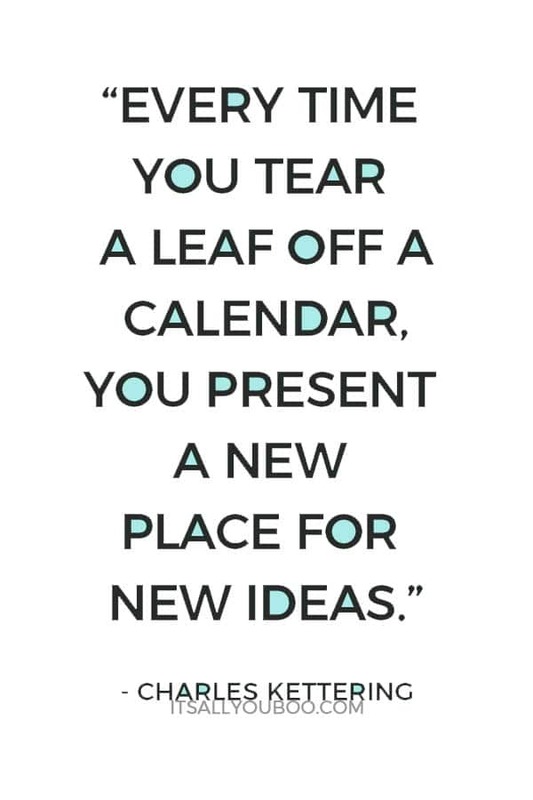 Yes for covering your walls in these inspirational end of year quotes. They’re perfect for students too! I love these quotes and will be back to reread them again and again. I love that you quoted Madeleine L’Engle as she is my favorite author!! You and me both! I love all these end of the year quotes, I’m always coming back to the blog and reading them when I need a boost. So many awesome quotes! I wish I had prints of all of them to hang up around the office. I have way too many favorite quotes, but one of them has to be “She designed a life she loved.” Thanks for sharing all of these!! Aren’t they! It’s really hard for me to just choose the best end of year quotes for this post.